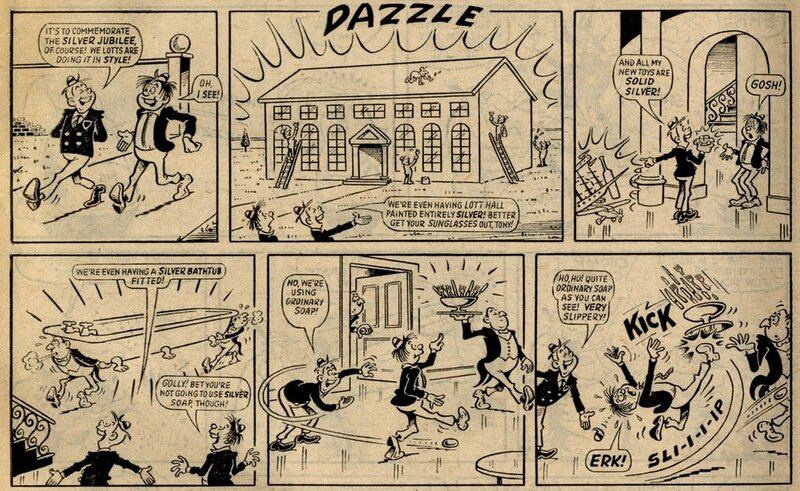 One of British comics’ grand traditions was the feast of slap-up nosh shared with a gang of pals. The Queen’s Silver Jubilee of 1977 provided the perfect opportunity for Buster and co. Cover by Rob Lee. The celebrations continued through virtually all the strips in this week’s Buster, including Buster’s Diary (Reg Parlett), Gums (Alf Saporito), Mummy’s Boy (Norman Mansbridge), Kid Gloves (Parlett), Ivor Lott and Tony Broke (Jim Crocker), Teddy Scare (Crocker), Kid Kong (Rob Lee) and Chalky (Arthur Martin).